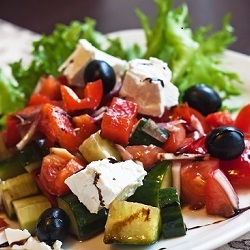 Greek cuisine has a tradition spanning thousands of years and it is an important part of the history and culture of the Mediterranean nation. Greek food in Australia also has a long standing tradition thanks to the many immigrants on our shores, especially Melbourne, which is home to the largest Greek population outside of Greece itself. 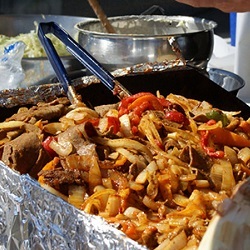 Our Greek caterers provide range of delicious dishes such as breads (daktyla, pita), appetizers & salads (dakos, Greek salad, lakerda, saganaki), soups (bourou-bourou, fasolada, trahana), vegetarian main dishes (bamies, gemista), and meat & seafood dishes (astakos, souvlaki, gyros). 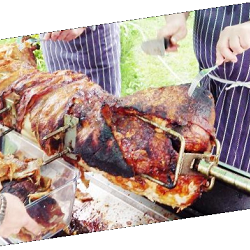 Souvlaki catering, lamb on split catering, charcoal chicken catering, Greek chargrilled BBQ and spit roast catering are the most popular types of catering people are looking for when they have a party, function or wedding. 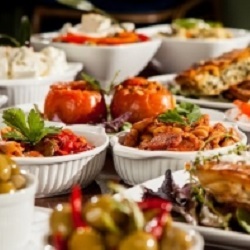 Once you’ve figured out the number of guests and your budget, it will be easy to find the best rated Greek caterers and food in Melbourne, Greek caterers in Sydney, Brisbane, Perth, Adelaide, Canberra and other cities in Australia who can provide you with menus that meet all your Greek cuisine needs. Caternow makes it easy to order Greek food so that you can enjoy delicious Greek catering, focus on your guests and not worry about searching suppliers, shortlisting them, calling to fix the menus or paying invoices. Whether you enjoy tradition or just want to try something different, Greek food is sure to satisfy, as will the ease of browsing catering menus and ordering the best Greek cuisine through Caternow. 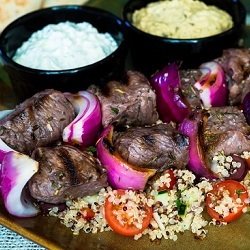 If you are planning a party or event and looking for souvlaki catering, lamb on split catering, charcoal chicken catering or spit roast catering then search local caterers below, order your favourite Greek catering and let us take care of your order.